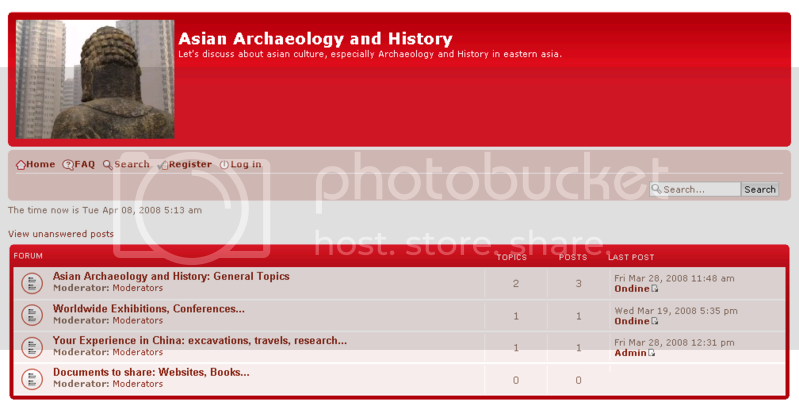 There’s a new web forum online dedicated to the archaeology and history of Asia. It was started by Ondine Martinez, who announced it over at the SEAArch Facebook page. The party’s only just started, so pay a visit and see what else pops up on the forum. It’s a great place to share, discuss and announce news and information about Asian archaeology and history. Ð’ÑÐµÐ¼ Ð™Ð¾Ñƒ! Ð­Ñ‚Ð¾… Ñ‚ÑƒÑ‚ Ð½Ð°Ð´Ñ‹Ð±Ð°Ð» ÐºÐ°ÐºÑƒÑŽ-Ñ‚Ð¾ Ñ…Ñ€ÐµÐ½Ð¾Ñ‚ÐµÐ½ÑŒ Ñ‚Ð¸Ð¿Ð° Ð·Ð°ÐºÐ¾Ñ Ð¿Ð¾Ð´ ÑƒÐ¿ÑÑ‡ÐºÑƒ. Ð›Ð¾Ð».